INDE – –Pondugula - A Buddhist site, probably belonging to the Satavahana/Ikshvaku dynasties, has been unearthed by a freelance archaeologist Kadiyala Venkateswara Rao, near Pondugula village in Mylavaram mandal of Krishna district. On trail of Buddhist remnants in Guntur and Krishna districts, Mr. Rao stumbled upon two marble pillars with engravings of Lotus Medallions and bricks used during the Satavahana period buried in a pit on a field at Pangadi village on the outskirts of Pondugula village, about 10 km from Mylavaram. The row of sitting bulls and lion motifs carved intricately on the huge Palnadu white marble stones, is strikingly reminiscent of the Amravati School of Art, says Mr. Rao. Similar pillars have been found at Buddhist sites at Jaggaiahpet, Ghantasala, Amaravati, Nagarjunakonda, and Chinaganjam. The site extending up to 10 acres is called Pattidibba in local parlance. Huge bricks, called Satavahana bricks of size 52X25X9 cm, covered with mortar lay scattered around the site. The site is also strewn with bases of broken pillars and marble pieces. “The presence of huge bricks indicates that the site may have been used for a construction of a stupa or a vihara or a chaitya. A huge water tank filled with lotus flowers located south of Buddhist site found near the site indicates that the site may have belonged to the Satavahana/Ikshvaku times during the first through thirrd centuries A.D,” Mr. Rao says. A brick mound, called ‘Itukala Koppu’ in local parlance, has 5-6 rock cut cisterns, which indicates that the site may have another Buddhist stupa. “The discovery of white marble pillars on a Satavahana Buddhist site is important and the ASI should take steps to protect the site and shift the marble pillars to ASI Museum to protect the Buddhist antiquity in the region,” Mr. Rao added. USA – Glass mounds - Toye Heape stood on the slope of an ancient Native American burial mound, confident in the significance of what was beneath his feet. The 1,800-year-old site has long been known to historians. But Heape, vice president of the Native History Association, was still excited to see state archaeologists slowly burrowing into the dirt last week. Archaeologists and historians have dated the mounds to about A.D. 200, during the Woodland period of Tennessee’s prehistory. Phosphate mining, farming and a series of harsh excavations in the mid- to late 1800s have threatened the integrity of the sites. The larger of the two mounds is visible from the driving range at Westhaven Golf Club and stands some 20 feet tall. The other, smaller mound is a few hundred yards north. 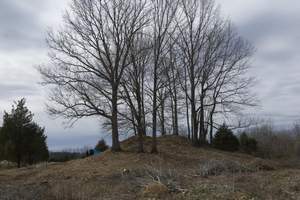 Williamson County and Middle Tennessee are home to a number of burial mounds, but these are among the oldest, according to the state. They’re often referred to as the Glass Mounds, a nod to the property’s former owner, Samuel F. Glass, who lived there in the 1800s. 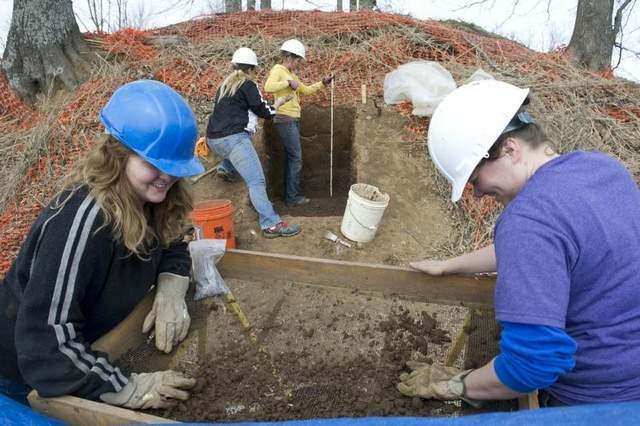 Previous excavations uncovered various items with which the deceased would have been buried, including some likely brought to the area by Native Americans from the Ohio Valley, Deter-Wolf said. A copper pan-flute casing, a metal ax and other artifacts from the site are kept at Harvard University’s Peabody Museum of American Archaeology and Ethnology. FRANCE – Tiffauges - Chaque projet d'aménagement d'un monument classé monument historique fait l'objet d'un diagnostic archéologique, pour vérifier au préalable s'il existe des vestiges susceptibles d'être affectés par les travaux. Des recherches ont été effectuées près de la chapelle, pendant trois semaines, par une équipe de la cellule d'archéologie préventive du conseil général. Jean-Noël Griffisch, archéologue auprès du conseil général, explique : « Une première phase de décapage a été réalisée pendant huit jours sur une surface de 200 m 2 . Ensuite, l'exploration du terrain a donné lieu à l'enregistrement de données, de prises de relevés, d'une couverture photographique et d'une fouille partielle de vérification. Nous avons eu la surprise de découvrir des vestiges en excellent état de conservation, malgré la nature acide du sol granitique. » Il poursuit : « Ces découvertes complètent les connaissances du site et ouvrent la voie à de nouvelles pistes. Une série de murs, de 1 m à 1,50 m de hauteur, forment de nouveaux bâtiments dans l'enceinte du château. Une aire funéraire, avec une quinzaine de sépultures couvertes d'un coffre de pierre, et deux squelettes d'adultes, constituent un cimetière médiéval, ainsi qu'une dalle funéraire gravée d'une épée et d'un triangle, pointe vers le bas. Deux meules ont été également mises au jour. » La zone fouillée va être remblayée. Un voile géotextile sera d'abord posé pour marquer les limites de ce chantier. Puis, l'ensemble sera recouvert de sable et de terre végétale afin de préserver les niveaux archéologiques pour d'éventuelles futures fouilles. ROYAUME UNI – Norwich - Seventeen suspected victims of religious persecution found at the bottom of a Norwich well are to be buried - an estimated 800 years after their deaths. 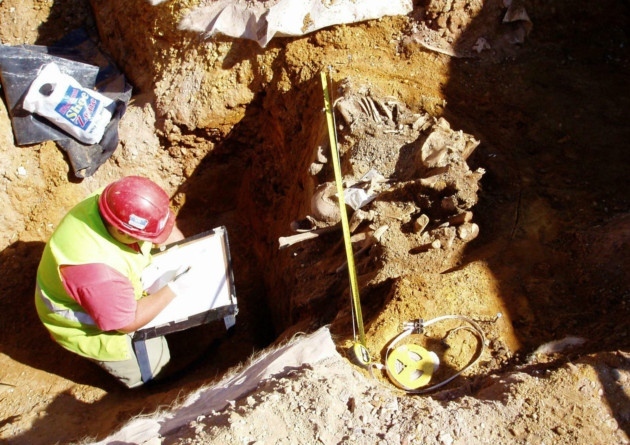 The skeletons, which included the remains of 11 children, were found during archaeological digs in 2004 ahead of work to build the Chapelfield Shopping Centre, in St Stephens Street. Tests later suggested the medieval bones, thought to have been there since the 12th century, had DNA consistent with Jewish communities although research is still being carried out. This presented research which concluded the people were likely to have been murdered or committed suicide and ruled out natural death. ROYAUME UNI - – x Kingsmead - Among the finds at Kingsmead Quarry, Horton, were four Neolithic houses thought to make up one of the oldest settlements ever found in England. Other finds at the site suggest people have used the area since the end of the last Ice Age, about 12,000 years ago. 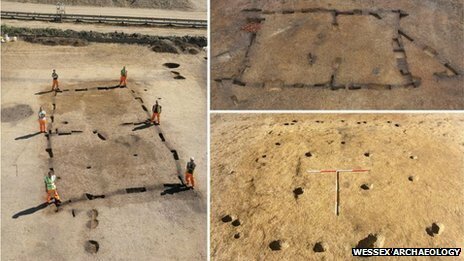 Archaeologists, who have been excavating on the site for 10 years, said the discovery of the 5,700-year-old Neolithic house foundations was "unprecedented". Pottery, flint tools, arrowheads, rubbing stones for grinding corn and charred food remains, including cereal and hazelnut shell, were recovered from the buildings, indicating the inhabitants were farmers. Many items will be on display at the exhibition. Excavations on the site near Windsor will carry on for the next two years and there could be more houses within the settlement that have not yet been discovered, Wessex Archaeology said. ROYAUME UNI – - Urgent action is needed to prevent ancient art disappearing, Newcastle University experts have warned. Researchers from the International Centre for Cultural and Heritage Studies (ICCHS) and School of Civil Engineering and Geosciences (CEG) studied the physical underpinnings and condition of Neolithic and Bronze Age rock art panels in Northumberland. They conclude climate change could cause the art to vanish because new evidence suggests stones may deteriorate more rapidly in the future. Writing in the Journal of Cultural and Heritage Studies, they say action is needed so the art can be preserved for future generations, but they also urge that a deeper understanding is needed of what causes rock art to deteriorate. Rock art is one of the earliest forms of artistic expression and emerged in different parts of the world over 50,000 years ago. 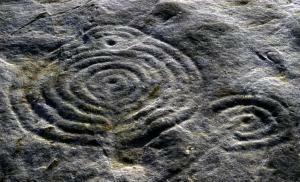 In Northumberland in Northern England, the rock art, which is between 6,000 and 4,000 years old, is mostly found on sandstone and the decoration is usually defined by cup-like features or complex patterns of cups, rings and grooves. The team, working with Dr Patricia Warke at Queen’s University, Belfast, studied 18 panels at locations across Northumberland. They first assessed the actual condition of the rock art panels and then compared it with 27 geochemical and physical factors such as soil moisture, salinity, pH levels and height. They found two factors were closely related to greater stone deterioration, the height of a panel and the level of exchangeable cations (ions) in the local soils.